Famously beautiful model Willow Bradford is taking a temporary break from her hectic schedule to work as the innkeeper at her family’s small-town bed-and-breakfast. She was enjoying the peace of her hometown, Merryweather, Washington, right up until she came face-to-face with Corbin Stewart, the man she loves to hate. A thoughtful rule-follower by nature, Willow threw caution to the wind four years ago when she entrusted her heart to Corbin–and suffered the consequences when it all fell apart. Former NFL quarterback Corbin is forceful, charming, and accustomed to getting what he wants . . . except where Willow Bradford is concerned. Unable to forget her, he’s never stopped regretting what happened between them. When their paths unexpectedly cross again, he’s determined to make her give him a second chance. When a decades-old missing persons case finds Corbin and Willow working together, they’re forced to confront their past and who they’ve become–and whether they can risk falling for one another all over again. As much as I related to Nora in True To You with her nerdy bookish self and the adoption themes (as you can tell from Tuesday’s post), in a lot of ways I relate more to Willow. I will never be model material and only consider myself beautiful on good days, but Willow struggles with two big things that I have as well: shame from a past relationship, and growing up, the feeling that I had to be the perfect child. Corbin is determined to draw her out. Since I have my own real life Corbin to draw me out of my safe shell, I understand Willow’s love/hate relationship with that aspect. We want to be safe, but also want to venture out…safely. These men God puts in our lives do that; I can’t hide under my rock too long. My favorite quote is from Corbin’s internal processing, “He needed her to love him And so he was going to make sure that she did.” Way to take the initiative, Corbin! But, he also had to learn how to be humble and surrender their future to God. A humbled man is a mighty thing to behold. And now we get a sneak peak at Britt beginning to soften and Zander being brave enough to step past his self-protective boundaries and get out there. I can’t wait for their story! I received a complementary copy of this story for review on this tour. I was not required to post a positive review and all opinions are my own! 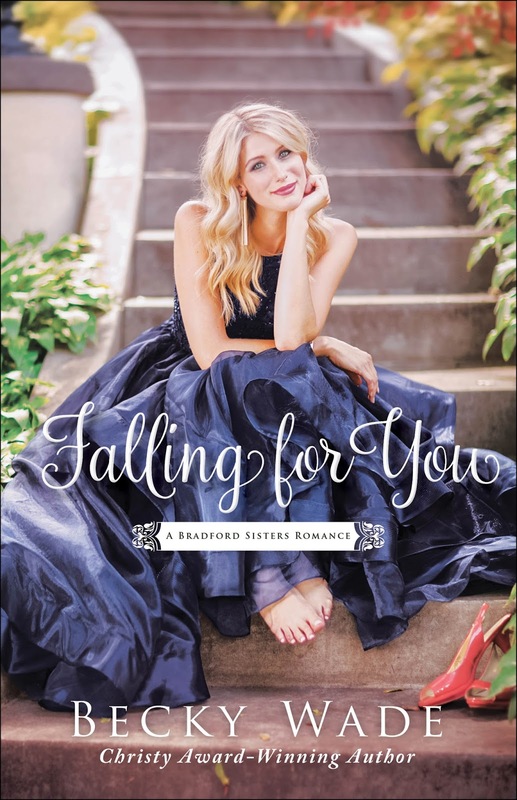 Celebrate the release of Becky Wade’s Falling for You by entering to win a fabulous prize pack that includes some of Willow Bradford’s favorite things!